Herod spent his last decade in the grips of turmoil fueled by an ever-growing paranoia. While he had achieved a degree of peace in Judea (despite the financial rigors imposed on his subjects due to Imperial taxes and his own extravagant building projects), there were always trouble spots to be dealt with, especially within his own family. During his seventy years Herod married ten wives and fathered fifteen children. Needless to say, troublesome rivalries found fertile soil. 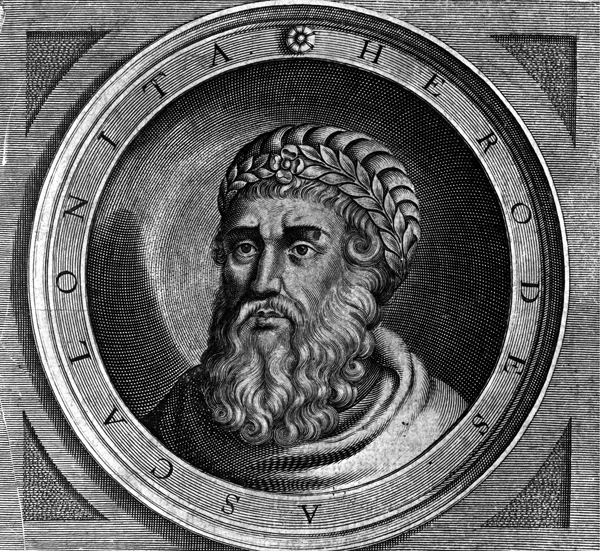 To make matters worse, Herod suffered the effects of a painful degenerative disease which affected not only his body but also his mind. He knew death was inevitable and imminent—there was no cure for his malady. The time had come for him to nominate, by Emperor Augustus’s request, an heir to assume his kingdom upon his demise. Obviously it would be a son—but which one? Early on, Herod divorced his first wife, Doris (a “commoner” so to speak), and banished her and his firstborn son, Antipater, in order to marry a true “royal,” the Princess Mariamme 1, of Hasmonean descent. She also bore him sons, Alexander and Aristobulus, and two daughters. The ensuing years were littered with political intrigue as mothers and sons, jealous siblings, shrewd sycophants and toadies, connived and maneuvered to grab the reins the instant of his death. The demented king saw threats everywhere—some quite real, others figments of his tormented mind. As Augustus requested, Herod put forth the names of three sons, Antipater, Alexander and Aristobulus, for consideration; in response, each ambition-driven mother with her cohorts sought to claim the throne for her son by whatever means at her disposal. In the end, it finished badly for them all: Antipater, Herod’s firstborn, was executed on a charge of plotting to murder his father; Mariamme was executed because of an alleged murder plot; her two sons were strangled on charges of treason; and Doris was once again sent into exile. Herod was increasingly plagued with fears of treason and impending overthrow, and the palpable Jewish expectation of a coming Messiah did nothing to calm his apprehensions. Just yesterday his spies brought word of a caravan arriving from the east, and among its travelers, Magi, wise men of some stature, with their gift-laden entourage, inquiring about one born King of the Jews. “We have seen his star in the east, and are come to worship him.” A King of the Jews?! Summoning all the chief priests and scribes, Herod got straight to the point: Where was this Christ to be born? Their reply: according to the prophet, in Bethlehem. His minions were no doubt already combing all Jerusalem to find out more, sneaking, demanding, investigating, threatening; before long the whole city knew that Herod was on a rampage, and braced itself for his growing fury. These wise men…they could be pivotal players in his manic search. Herod arranged for a private audience with them, and a plan took shape. First, a question. Exactly when did they see this star? If it took several weeks, or months even, for these Magi to make their journey, how old might this…this king be—days, months, even a year or more? Then suppose he feigned a shared interest in paying homage also, and encouraged them to continue on their quest and keep him informed? Once Herod knew the child’s whereabouts, he could quickly dispatch this interloper. The Magi, unaware of such a murderous plot, played into his hands, and set off for Bethlehem, still guided by the star. Jesus was eight days old, and according to the Law, it was time for his circumcision. Joseph and Mary sought out the local Mohel to perform the age-old rite. The young mother comforted her crying infant, and soothed away his tears with the gentle sound of her voice. Their bond was already strong, and she found herself pondering many of the recent events which had so dramatically changed their lives. What did the future hold for this Son of God? Perhaps this question loomed large a month or so later. Mary’s days of purification were completed and the time for Jesus to be consecrated to the Lord had arrived. Both events required sacrifices, and so Mary and Joseph with their precious son journeyed to Jerusalem and climbed the steps to the temple courtyard, making their way to the Court of the Women to fulfill their duties. Unexpectedly, out of those gathered in the temple precincts, a man appeared, one Simeon by name, and took the infant Jesus in his arms, blessing God, saying, “Lord, now You are letting Your servant depart in peace, According to Your word; For my eyes have seen Your salvation which You have prepared before the face of all peoples, A light to bring revelation to the Gentiles, And the glory of Your people Israel” (Luke 2:29-32). The parents marveled as he continued, speaking directly to Mary, “Behold, this Child is destined for the fall and rising of many in Israel, and for a sign which will be spoken against (yes, a sword will pierce through your own soul also), that the thoughts of many hearts may be revealed” (Luke 2:34-35). Surely she would revisit this scene in the years to come as she and Jesus lived through the full implications of Simeon’s foreboding words. A very old woman, a prophetess named Anna, upon witnessing this encounter, added her blessing, thanking the Lord, and explaining to all who would hear that the long-awaited Messiah had been born. Mary must have watched with interest as the group of foreigners approached, fascinated by their strange accents, their quick gestures, and their obvious delight at what appeared to be a star hovering directly over the couple’s house. She learned these were Magi, dignitaries from the east, who were on a quest. Was it a whimper or a full-blown cry that attracted their attention, stopping all conversation, and causing the strangers to turn in her direction? Perhaps as she shifted position and lifted Jesus to her shoulder, the realization hit them: They had come in search of the one born King of the Jews; they were led to this very place by a star; and now here he was, in the arms of his mother. Scripture records that the wise men dropped to their knees and worshiped him. Then they presented the little child with chests of gold, and frankincense, and myrrh, gifts carefully guarded and transported over hundreds of miles, gifts in honor of the King. Herod’s plan was about to be thwarted by God Himself with two dreams. First He warned the wise men not to return to Herod, but rather to choose another route for the journey home. And He warned Joseph to take his family and leave immediately, that very night, and flee to Egypt. By the next day, both parties were well en route. When Herod realized that his plan had gone awry and he had been outwitted by the Magi, he flew into a murderous rage, and issued a chilling edict: All boys from two years old and under living in Bethlehem and its environs would be killed. Scripture records, “Then was fulfilled what was spoken by Jeremiah the prophet, saying: ‘A voice was heard in Ramah, lamentation, weeping, and great mourning, Rachel weeping for her children, refusing to be comforted, because they are no more’” (Matt 2:17-18). 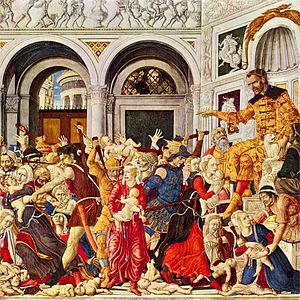 To this day, the event, sometimes referred to as the Massacre of the Innocents, is synonymous in the minds of many with Herod. After Herod’s death Joseph had one last dream. It was finally safe for his young charge to return to Galilee, and particularly to Nazareth, thus fulfilling yet another prophecy: “He shall be called a Nazarene” (Matt. 2:23). Mary’s son, One born King of the Jews, would live to fulfill many more. There is no easy identification of who these individuals were. Possibilities include Babylonians and Persians. See The Expositor’s Bible Commentary comments on Matthew 2. Scholars estimate that based on the size of Bethlehem (a small village), perhaps a dozen or so baby boys were murdered in Herod’s attempt to stop a threat to his throne. Stewart Perowne, Herod the Great, His Life and Times (1956), pp. 172-173. Posted in Bethlehem, Bible women, Birth of Christ, Caravans, Circumcision, Herod the Great, Herod's family, High priest, Jerusalem, Joseph, Mary, Massacre of the innocents, Rites of purification after childbirth, Uncategorized. Bookmark the permalink. Mary barely heard the urging of the women as her body responded to contraction after contraction, unrelenting waves of pain, each closer to the one before, until finally… one huge push, and there were no more. Seconds later, a baby’s cry filled the air and she felt tension drain from her body like wine from a ruptured wineskin. Swiftly deft hands cut the umbilical cord and lifted her squalling infant, wiping away amniotic fluids and washing him gently with warm soothing water. She held out her arms to comfort her little one, his arms and legs flailing, searching the familiarity of her warm body. Holding him close and stroking away his tears, she rocked gently, humming a melody only mothers know, until his crying gave way to silence as he listened. She pulled back the blanket, marveling at his beautiful fingers and tiny toes, the plump softness of his body, the wisps of fine dark hair framing his brow. He was perfect in every way. 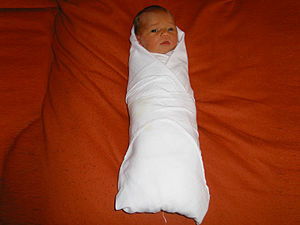 Reluctantly she handed him back and watched, taking note, as he was swaddled securely with linen strips. Then, in her arms once again, she put him to her breast and smiled, wincing a little as he nuzzled, then latched on and suckled contentedly to drink his fill. In one sublime moment their eyes locked on each other, mother and son, and her heart soared. Joseph quietly entered upon this touching scene and stood watching, his curiosity and awe obvious. The past nine months had not been easy. The shock and indignation when the truth of Mary’s swelling belly could no longer be denied. The feelings fueled by trust betrayed. Struggling with what must be done. Law in the extreme dictated stoning even when parties were only betrothed, but few, if any, did that these days. A quiet divorce with no reason given, in the presence of two witnesses—that seemed the only just thing to do. He did not want to shame Mary publicly, even in his hurt and anger. This way she could quietly prepare for the consequences to come. And he could begin putting his life back together. While that was the course he intended to follow, a heavenly messenger cast a new light of understanding on an otherwise dismal situation. “Joseph, son of David, do not be afraid to take to you Mary your wife, for that which is conceived in her is of the Holy Spirit. And she will bring forth a Son and you shall call His name Jesus, for He will save His people from their sins” (Matthew 1:21). Joseph himself was destined to be part of a grander plan. Now he stood looking at the fulfillment of the angel’s word, sleeping peacefully in his mother’s arms. “Jesus,” he said to Mary. “He will be called Jesus.” “Yes. He will be called Jesus,” Mary responded softly, and gently placed her swaddled babe in his make-shift manger bed. The world would soon know that the Son of God was born in Bethlehem that autumn day. Joseph’s part in the story of the birth of Christ is often overlooked. But in the opinion of The Expositor’s Bible Commentary, a comment concerning Matthew 1:24-25 observes, “While the story is told simply, Joseph’s obedience and submission under these circumstances is scarcely less remarkable than Mary’s.” Barnes’ Notes adds, concerning Joseph as a “just” man: “The meaning is that he was kind, tender, merciful; that he was so attached to Mary that he was not willing that she should be exposed to public shame. He sought therefore, secretly to dissolve the connection, and to restore her to her friends without the punishment commonly inflicted on adultery” (see note on Matthew 1:19). Naming a child was of the utmost importance, and the Bible reveals instances where both mothers and fathers did the naming. In Jesus’ case, God, His Father, chose His name, and both Mary and Joseph complied. In that day, sons were often named during the circumcision ceremony. Scripture seems to indicate Jesus was called by His name from the time He was born. Posted in Bethlehem, Bible women, Birth of Christ, Breastfeeding, Joseph, Manger, Mary, Mothers, Nursing, Uncategorized. Bookmark the permalink. It was the last day of a long, tiring journey. Five or so miles further, and Joseph and Mary would be in Bethlehem. At last, a respite from all the jouncing and jarring over hard-packed country roads. Just to stay in one place for a while—what a relief! This wasn’t Mary’s only trip out of Galilee that year. 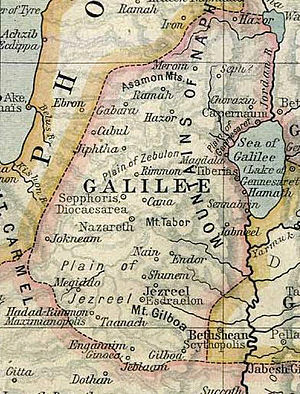 Not so many months before, after her remarkable encounter with Gabriel, she had hurried south to the hill country of Judea to see her cousin Elizabeth and share her wonderful news. Would she ever forget Elizabeth’s greeting that day? “Blessed are you among women, and blessed is the fruit of your womb! But why is this granted to me, that the mother of my Lord should come to me?” Her cousin already knew! Mary, her heart filled with adoration, humbly responded, “For He has regarded the lowly state of His maidservant; for behold, henceforth all generations will call me blessed” (Luke 1:48). The two of them, one, aged and past child-bearing years, the other, young and a virgin, both pious, both miraculously pregnant and favored before God, spent three months together before Mary returned to Nazareth, and her future. If she understood the prophecy in Micah 5:2, she knew it meant that she would make yet another journey—this time to Bethlehem, the city of David—where her miracle son, Jesus, would be born. How ironic that Caesar Augustus, the first Roman emperor, and his edict, served as the impetus to get her there, and bring about the fulfillment of inspired words uttered 600 years earlier. Joseph came to terms (after some angelic intervention) with Mary’s bewildering condition, and with her role in his life and in God’s plan. Now he had to ensure the safety and well-being of his very special charges. The first order was to find a place to stay. Bethlehem, normally a quiet little village of 1000 or so, was struggling to accommodate the numbers who had come to be counted in Caesar’s census. Rules of hospitality dictated that villagers open guest rooms in their own homes to travelers in need of food and lodging. In this instance, registrants might have had relatives who would take them in since they were in their ancestral home. That may have even been the case with Joseph and Mary. Otherwise strangers were to be welcomed wherever there was space. Homes of that day were made of mud brick, and normally consisted of one to two rooms on one level and a terrace area containing a permanent stone manger for fodder to accommodate the family’s livestock. It was not uncommon that guests be housed there in the event of an overflow. It’s easy to imagine beds being rolled out in one area and perhaps a donkey or cow slumbering in another. Not only did their body heat add warmth for the household and the guests, the critters were kept safe from thieves and predators. At morning light animals were led to pasture and the terrace floor routinely cleaned and swept. It is likely that Joseph and Mary found lodging in a private home, not in the usual guest room, but on just such a terrace level. They were warm and secure; food and water were available; they had access to help if they were still there when Mary’s labor began; and there would be a suitable place for a newborn in the security of the manger. Within the next several days they were obliged to make their way to the official place for registration. Mary found herself standing beside Joseph, waiting impatiently for the line in front of the Emperor’s bureaucrats to shorten, shifting her weight from time to time, rubbing the small of her back to ease the strain, acutely conscious of the little life within her belly, pushing and nudging. There is some discussion as to whether Elizabeth and Mary were first cousins, or distant cousins, or how exactly they were related. The New King James version simply calls her a “relative.” The general opinion is that they were cousins. The Bible gives no details concerning Mary’s route, the mode of her travel, or the time it took. 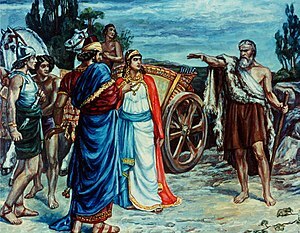 In looking at a map, it seems likely that months later she and Joseph retraced at least a portion of her travels, especially the part that avoided Samaria. Normally these were in the home itself, but sometimes a separate room was built alongside the house itself to house guests. A guest room could have been in a cave if the cave was part of the home itself, which was sometimes the case. The current tradition of Jesus being born in a stable in a cave, essentially isolated from the town and away from helping hands, does not jive with the cultural standards of hospitality of the day. In a visit to Switzerland some years ago, we noted houses with animals sheltered under the living area, so the practice has endured over time, not only in the Middle East, but other areas of the world as well. Posted in Bethlehem, Birth of Christ, Caesar Augustus, Guest rooms, Inn, Joseph, Manger, Mary, Taxation, Uncategorized. Bookmark the permalink. Mary packed as though she and Joseph were changing residences rather than making a round trip—that’s what astute travelers of her day did. 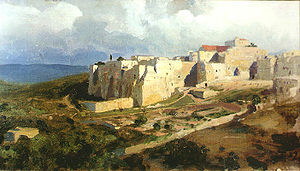 Perhaps she had an idea or premonition that it would be a long time before they would return to Nazareth and home. There would be caravanserais along the way, usually situated where roads crossed, for food and water, bathing, supplies, fodder for the animals, and places to sleep; but the wise and experienced often brought along their own tents and blankets as well as clothing and containers of dried raisins and other foodstuffs, water, oil, and flour, prepared for any eventuality. Joseph was well aware of the difficulties of such a journey, not just for Mary in her condition, but for their safety as well. The eighty-mile trip could take as many as five days or possibly more, depending on the route and traveling conditions. The shortest and most direct way, through Samaria, was not an option for most Jewish travelers in light of long-standing animosities. They would rather face the threat of robbers and bandits who often menaced the next best highway. Caravans frequently traversed Roman roads, including the one he likely chose—the road that went east from Nazareth, crossed the Jordan, and ran south through Perea toward Jerusalem. Ideally they could join such a convoy and lessen the danger along the way. Such a group contained a lively cross-section of humanity. Along with the average traveler and perhaps courses of priests on their way to fulfill their duties in the Temple, opportunistic hawkers often joined these odysseys, producing the latest articles of commerce or luxury, and passing on the most titillating news of the day. Nighttime chatter around campfires must have been a welcome relief from the monotony of seemingly endless miles of travel. Did Joseph and Mary hear grumbling about the latest demands and scandals of Rome? Most likely, and with good reason. The general population was already taxed to the limit, and now this. Word had it that Caesar was displeased at the declining birthrate in his empire, and this census would confirm his annoyance. It would not only give him his numbers, but replenish his coffers as well. Resentment seethed under the surface at the injustice of it all, a malignant stow-away on this mandatory trek to be counted. What they needed was a deliverer, and soon! Follow the link below for a picture of an Ottoman caravanserais built in the 1700s. Those available to Mary and Joseph were probably much smaller, but were also walled enclosures with guest rooms on upper levels, and the terrace level below, used for bedding down the animals. At night the gate was secured to protect travelers from robbers and wild beasts. Palestine was home to highwaymen who robbed only for personal gain, and guerrilla warriors who directed their aggression against Roman Authorities and/or the Jewish authorities and persons who collaborated with them. Even the Apostle Paul was alert to such dangers in his travels (2 Corinthians 11:26). For more information on the social world of bandits, see the following link: http://bibleresources.americanbible.org/node/1511 . Alfred Edersheim, in his Sketches of Jewish Social Life in the Days of Christ (1980), mentions six different highways or main arteries of commerce in Palestine. See Chapter IV, pp. 42-45. The one I chose for the journey of Joseph and Mary seems to me to be the most likely. Richard A. Horsely with John S. Hanson, Bandits, Prophets, and Messiahs (1985). During the time of Julius Caesar, “the Jewish agricultural producers were now subject to a double taxation, probably amounting to well over 40 percent of their production. There were other Roman taxes as well, which further added to the burden of the people, but the tribute was the major drain” p. 56. “If a peasant family, after rendering up 40 percent or more of its harvest, then had too little left to survive until the next harvest, it would have to borrow grain for food, or for seed for the next sowing….Continued borrowing would increase a family’s debt significantly, with great risk of complete loss of land …[and] sink into the ranks of…the landless day laborers, or…become a sharecropping tenant” (pp.58-59). 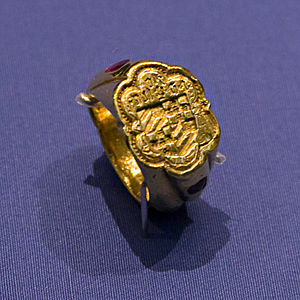 Dio Cassius, Roman History, 1vi, 1-10. Dio Cassius tells of one occasion when Augustus was so vexed by the declining marriage and birth rates that he strode into the Forum, separated the married men and bachelors he found there into two different groups and then let the bachelors have it: “What shall I call you? Men? But you aren’t fulfilling the duties of men. Citizens? But for all your efforts, the city is perishing. Romans? But you are in the process of blotting out this name altogether! . . . What humanity would be left if all the rest of mankind should do what you are doing? . . . You are committing murder in not fathering in the first place those who ought to be your descendants!” Quoted in Paul L. Maier’s In the Fullness of Time (1991), p.6. 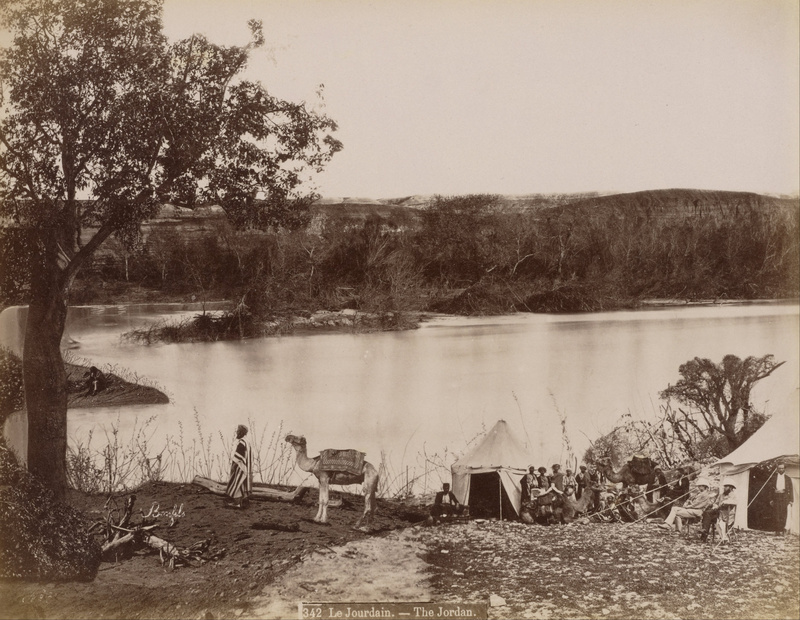 Posted in Alfred Edersheim, Bandits and robbers in Palestine, Bethlehem, Bible women, Caravans, Caravanserais, Census, Jerusalem, Joseph, Mary, Nazareth, Taxation, Uncategorized and tagged Alfred Edersheim. Bookmark the permalink. For over 500 years the nation of Israel chafed under the thumb of first one Gentile kingdom and then another—Babylon, Persia, the Greco Macedonians, and now Rome, with its absolute ruler Caesar Augustus, and Herod the Great, one of his ruthless client kings. It wasn’t unusual, particularly during Passover season, for passions to ignite as the tribes of Israel revisited the story of God’s intervention and the stunning liberation of their ancestors. When the white-hot flames of resistance and rebellion flared, they were summarily stamped out under the cruel boot of Herod’s soldiers. Exorbitant taxation compounded the misery of oppression in pre- and first-century Palestine: the mandatory tribute to Rome; locally imposed taxes; several layers of temple tax; impromptu levies to fund military expeditions and building projects. Privation and hardship enveloped the land like a dank, smothering blanket, and peasants found themselves forced to sell their land holdings—inheritances from generations past—in order to survive. The swelling ranks of day laborers told the tale. As things worsened the dream of a messiah-deliverer flourished, only to fall prey to opportunists and pretenders. Pseudo-messiahs deluded the people with false hopes, created dissensions, and gave rise to sects. Their influence was mostly local and temporary; some, however, succeeded in attracting large numbers of followers, and created movements that lasted for considerable periods. Others, along with their ardent followers, died as insurrectionists. On a cool autumn morning sometime before Herod’s death, in the frontier town of Nazareth in Lower Galilee, a young woman prepared for a long trip to Bethlehem. Caesar Augustus called for a census, declaring “all the world should be taxed” (Luke 2:1-5) and ordered that everyone must register in their ancestral home. And so, Mary, nearly full-term in her pregnancy, helped Joseph load the cart with the necessities they would need to see them through their journey to the ancient city of David. She must have replayed the angelic visit innumerable times, and marveled at Gabriel’s amazing pronouncement. “Do not be afraid, Mary, for you have found favor with God. And behold, you will conceive in your womb and bring forth a Son, and shall call His name Jesus. He will be great, and will be called the Son of the Highest, and the Lord God will give Him the throne of His father David. And He will reign over the house of Jacob forever, and of His kingdom there will be no end” (Luke 1:30-33). While Herod in his paranoia planted spies and scoured the countryside for seditious plots and traitors, the prophesied King of Israel, the longed-for Deliverer, quietly and miraculously grew in the safety of the womb of a young virgin, Mary of Nazareth, waiting to be born. The Archaeological Study Bible (2005), p. 1669, a note on Luke 2:5 states that in Syria (the Romans included Palestine under Syrian jurisdiction) “women twelve years of age and older were required to pay a poll tax and therefore to register.” This would explain the historical impetus for Mary’s making this trip, and the advancing of a divine plan. Posted in Bandits and robbers in Palestine, Bethlehem, Birth of Christ, Herod the Great, Joseph, Mary, Nazareth, Pseudo-messiah, Roman census in Palestin, Uncategorized. Bookmark the permalink.